I had some ginger leftover from the stir-fry I recently made and so I thought to myself, "hey, ginger pork." 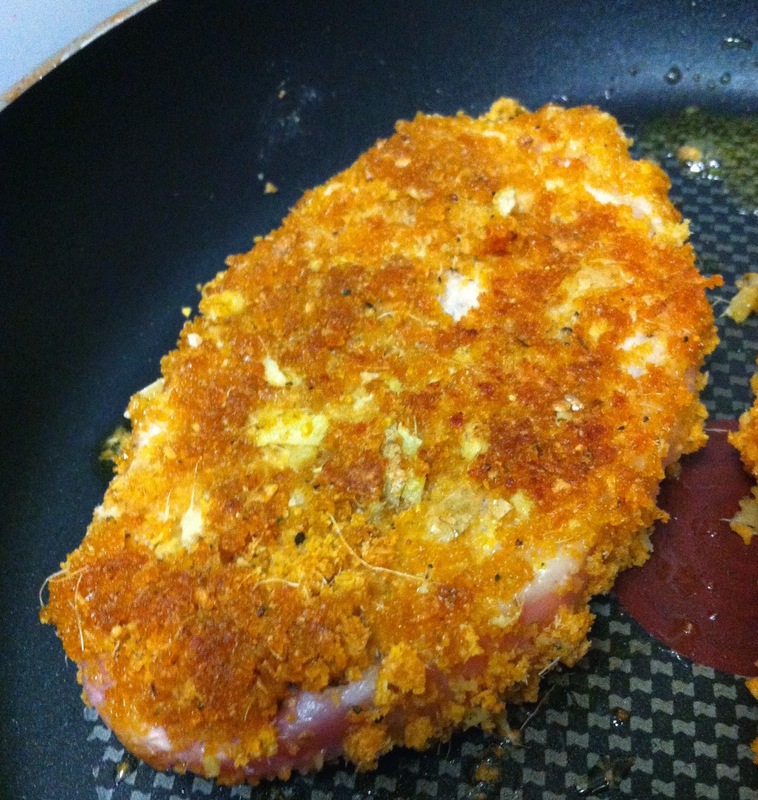 then I also thought I wanted to try something different so I incorporated the ginger into the actual breading of the pork chop. The result was amazing; a slightly spicy, sweet, and crisp combination. 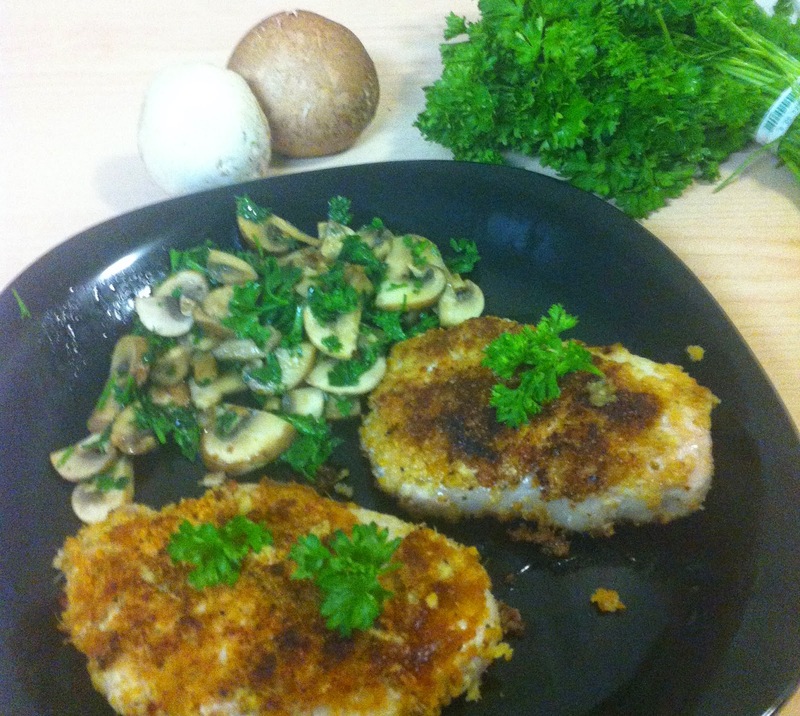 The mushrooms only added richness to the dish and made it that much better. 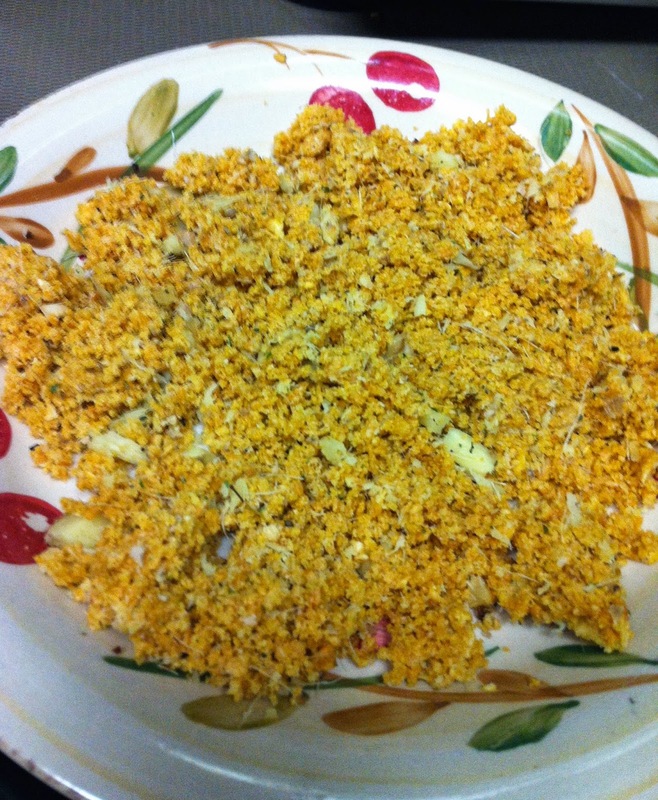 Step One: Cut ginger into small pieces and place in a blender or food processor (I used a magic bullet) with the cornflakes, and if desired a few spices (I used a pre-made 'pork seasoning'). 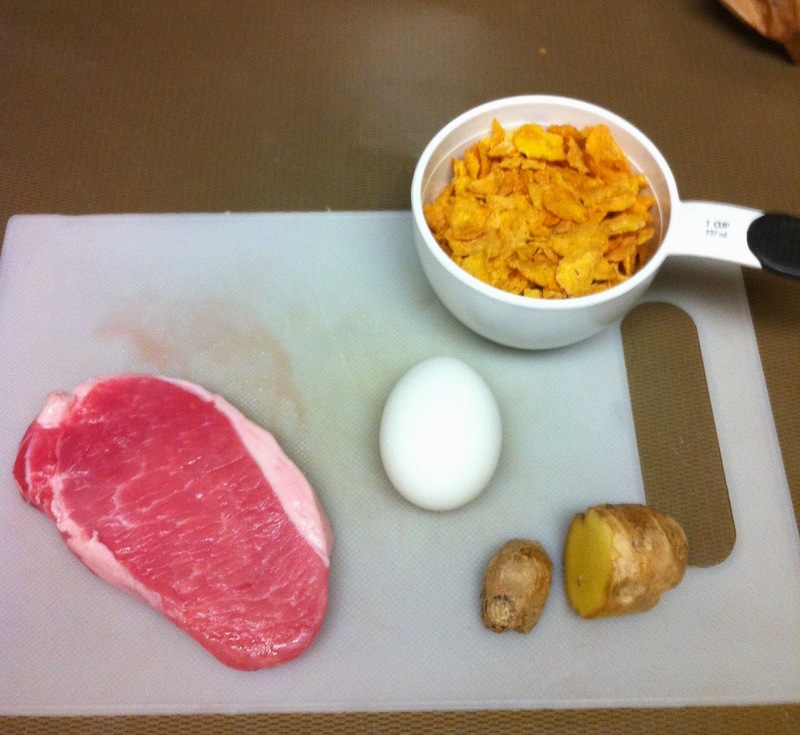 If you don't have any of these items, just crush up the corn flakes and make sure to cut the ginger into very small pieces, then mix them together thoroughly in a bowl. Pulse this rather than a straight blend because a powder like consistency is undesirable in this situation. 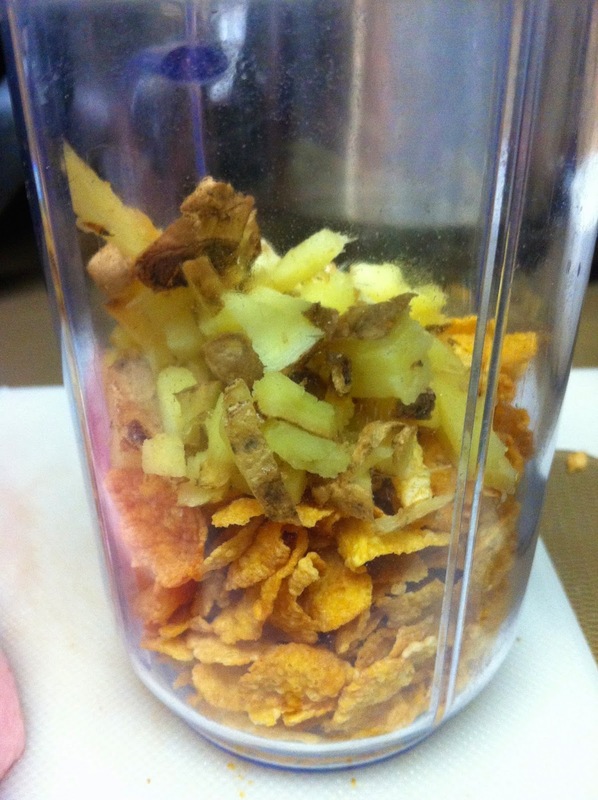 You may need to use a spatula to scrap the sides and bottom of the container a couple times because the liquid from the ginger will cause the corn flakes to stick together. 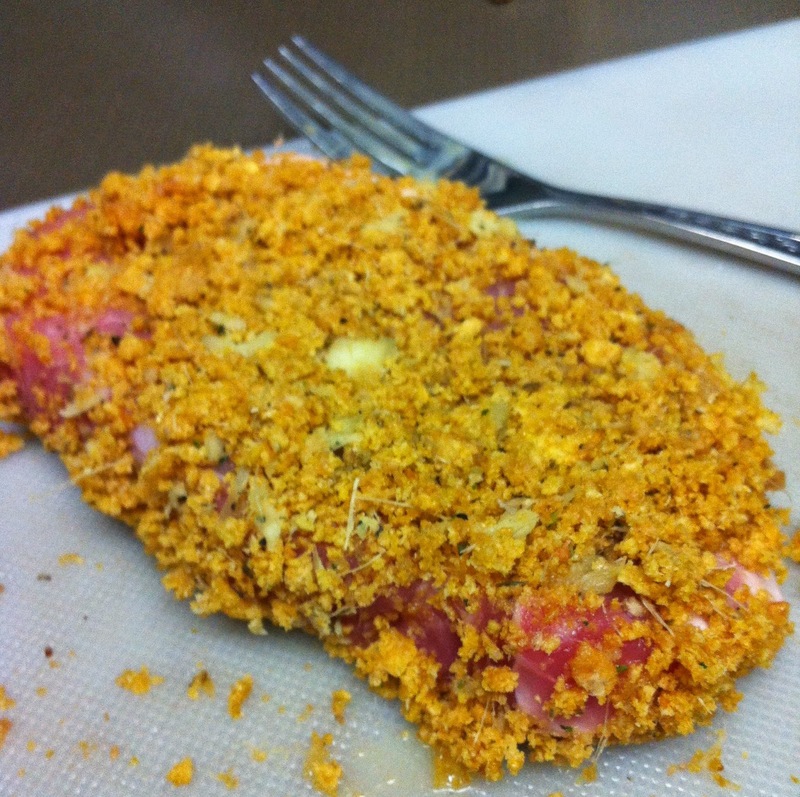 Then lay the breading out onto a plate like pictured above, making sure that it is moderately even. Step Two: Crack the egg into a bowl then dip the pork chop into the egg liquid and bread both the top and bottom of the pork chop. The water in the ginger will help the breading stick to the chop, so you only need to do this sequence once. Make sure to apply ample pressure to the chop making sure the breading sticks. Step Three: Put a generous amount of oil into a pan and then on a medium heat place the chops onto the pan. Flip often, every two minutes, and make sure that each side is in contact with the pan at least three times if flipping every two minutes. Or, if you have a meat thermometer, make sure the internal temperature reaches around 180 degrees. 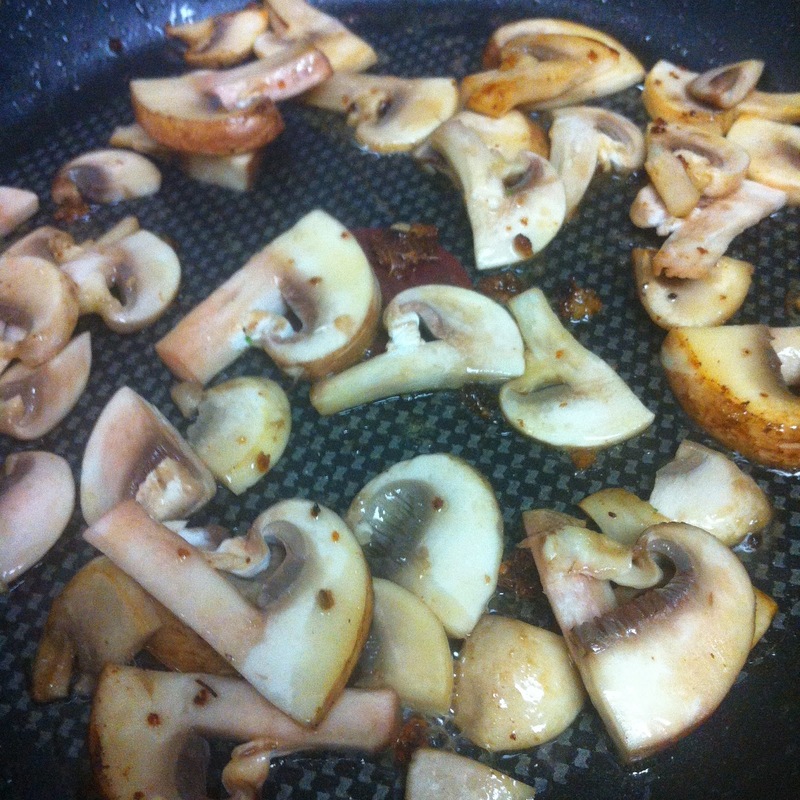 After frying is complete set aside and begin to cook the mushrooms. 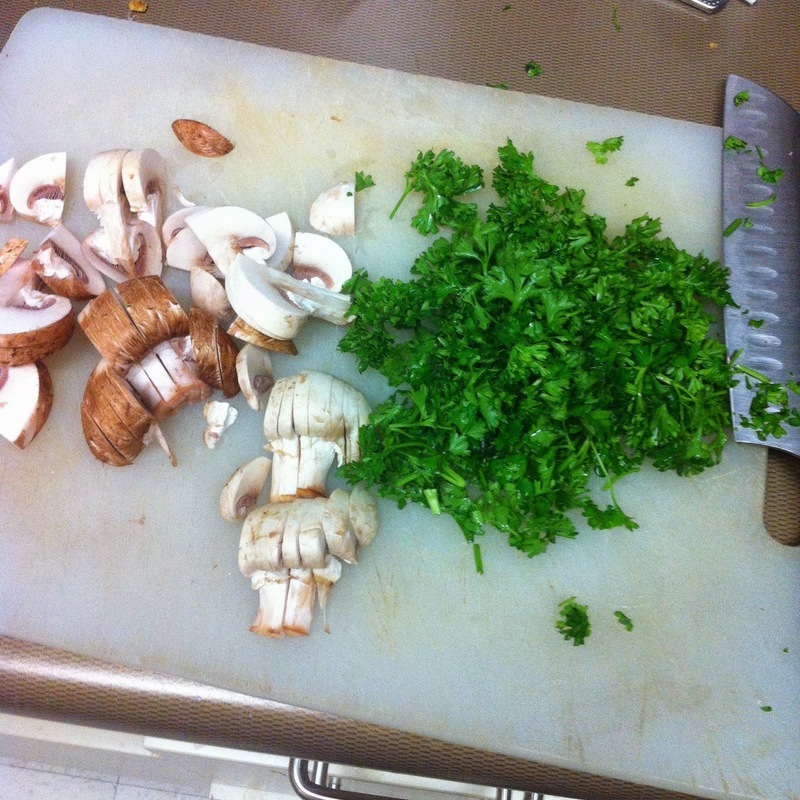 Step One: Slice the mushrooms thinly and cut the parsley finely. 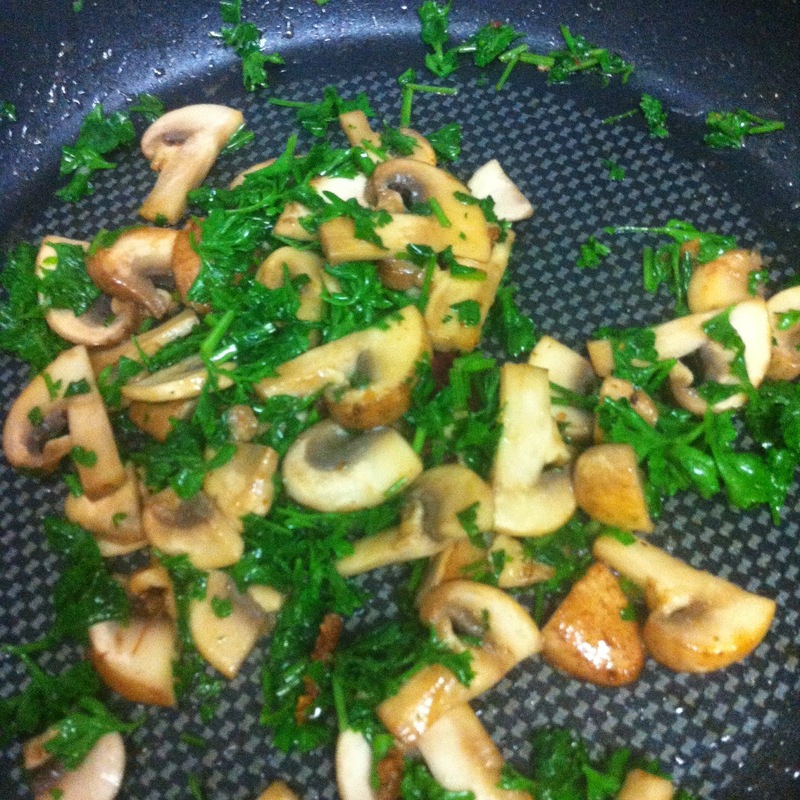 Then put a generous amount of butter into a pan (preferably the same pan). Step Two: Start to brown the mushrooms in the butter. 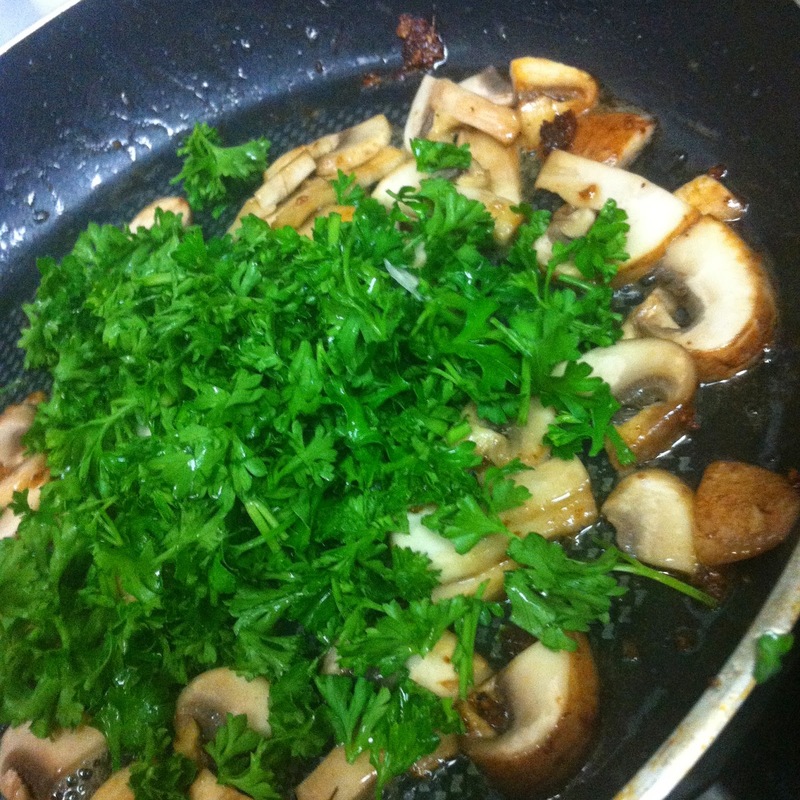 Once the mushrooms are tender and browned evenly mix in the parsley. 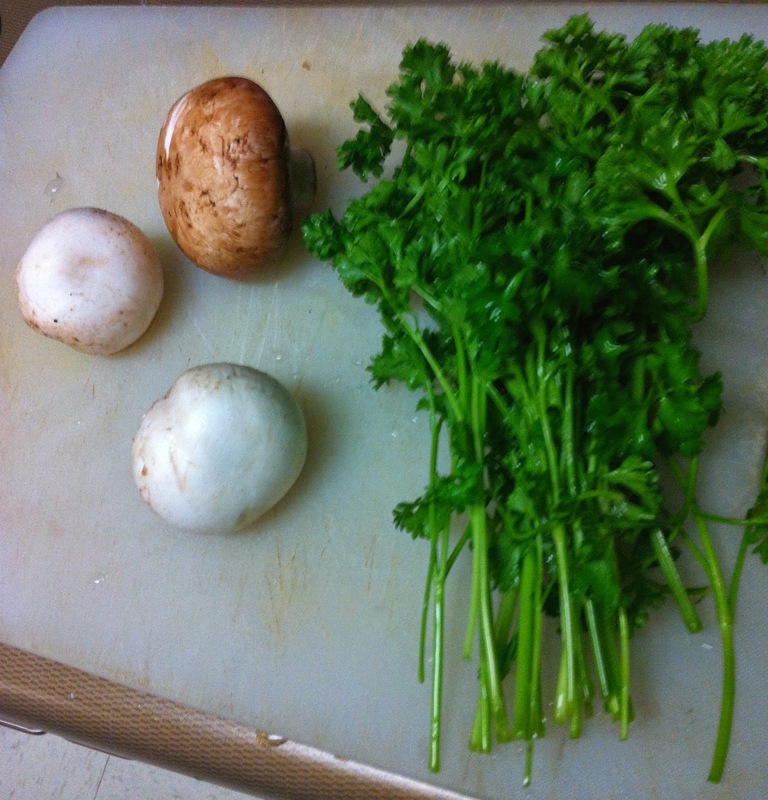 Mix the parsley in and let wilt for around one or two minutes. 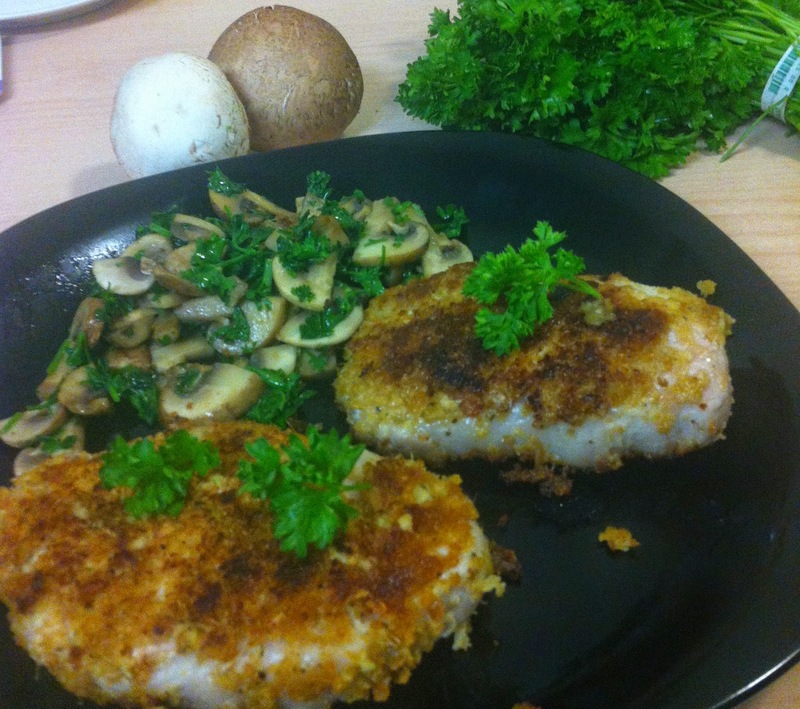 Serve with the pork chops, and garnish with parsley. Enjoy !